I meant to post this last Wednesday but as previously stated I got a bit caught up in some book series and I kind of lost track of all time! Silly thing is I already had it edited and ready to go, CRAZY! Anyway the plan is to put out a new video every two weeks. I hope it isn’t too slow for you guys and I hope (I hope) someone actually enjoys these and even learns something! Remember I like to cook with 3 inch pans instead of the normal 2 inch pans. I also like to cook one tall layer, rather than deal with two short layers. If your looking for it here is my instructions for how to prepare your pan for baking, as well as how to cook a tall cake layer! Remember to let me know what else you’d like me to make video tutorials on! Great video! 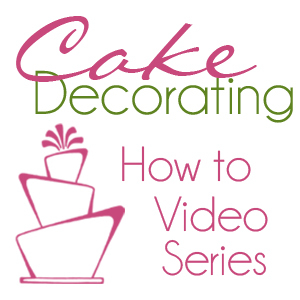 have you used those insulating wraps that make it so the cake bakes evenly and doesn’t rise in the middle? If so, do you still cut the top off so that there is a raw edge for frosting and crumb coat? I do use them sometimes. Depends on the cake. Because all my cakes are made from scratch not all of them NEED it. So it totally depends on the recipe. And I ALWAYS cut off the top, I don’t want a domed look EVER, so I always cut it to get a nice sharp edge! Hey, love your site! Thanks for sharing all your hard work! I can’t seem to find your chocolate cake recipe, would you mind sharing? Thank you!! i have the flourless chocolate cake on the blog, but my chocolate cake that I use for my cake business I don’t share. I don’t share my cake and frosting recipes usually, it’s my business. Sorry.